Why is a Snake Symbol of Medicine and Pharmacies? The snake has been used as a symbol by pharmacies and doctors for a very long time. 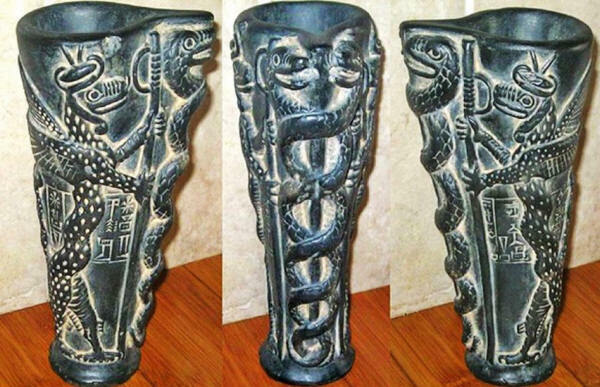 The serpent is a symbol of medicine and through the iconography of pharmaceutical history, snakes appear wrapped around a staff or a bowl. There are various types of snakes used as medicine symbols. Modern pharmaceutical signs have a long history going back to ancient Greece. According to the Greek myths, Asclepius, the Greek God of medicine learnt the art of healing from both his father Apollo and the centaur Cheiron. In time, he became so skilled in surgery and the use of drugs that he was revered as the founder of medicine. A major sanctuary was dedicated to him at Epidaurus, the place where he was born. 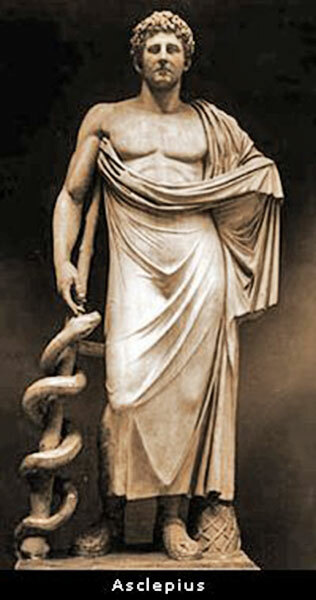 It was believed that Asclepios (Aesculapius) had the power to rise from the dead. Legend tells that Zeus was worried that Aesculapius would make mankind immortal because of his healing power. Out of fear, he killed Aesculapius with a lightning bolt. Temples were built for Aesculapius, and seemingly dead serpents were found inside. When these serpents were picked up and dropped, however, they slithered away. To people this was interpreted as that the serpents were brought back to life by the healing powers of Aesculapius, which ultimately caused them to be associated with healing. Tame snakes were kept in his temples as this animal was regarded as a symbol of regeneration. From about 300 B.C. onwards, the cult of Asclepius grew very popular and pilgrims flocked to his healing temples (Asclepieia) to be cured of their ills. 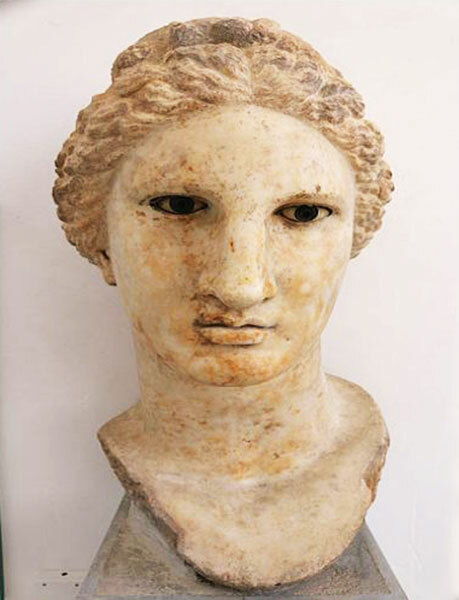 Sacred Asclepion of Pergamum was an ancient healing center and the world's first psychiatric hospital. 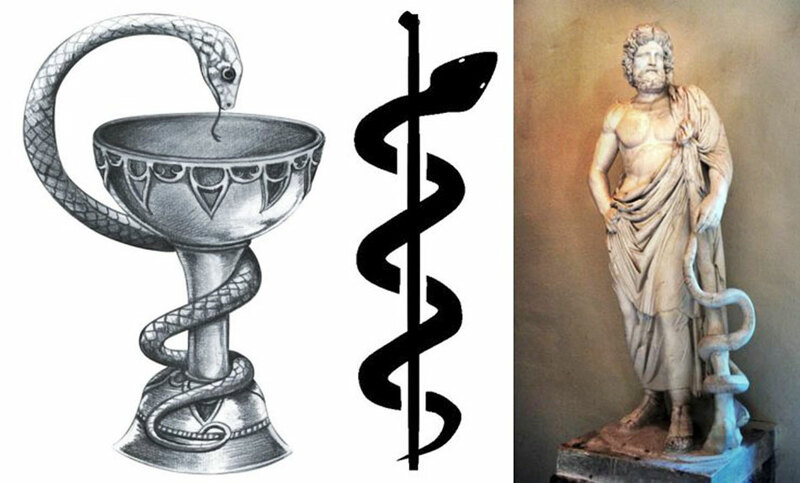 The Rod of Asclepius, also known as the Staff of Asclepius, a serpent-entwined rod wielded by the Greek god Asclepius is today associated with medicine and health care. It's the symbol of medicine, but it's often confused with the staff of the god Hermes, the caduceus. Hygieia, Goddess of Health hygiene who was the daughter of Asclepius tended to his temples. Her symbol became a bowl containing a medicinal potion, with the serpent of Wisdom drinking from it. The serpent is symbolic of resurrection, and the bowl health and medicine. Modern people associate the snake with poison, but the animal had a powerful symbolic meaning to our ancestors. dedicated to Ningishzida (21st century BC). The double helix depicts the deity. The story of the Serpent People and their guidance is known world-wide as long as anyone can remember. Collectively, they were all known as the Serpents of Wisdom and their great contribution to the global development of our planet can never be erased.